Every number will come out ! You will get hot numbers You will get Cold numbers, No numbers comes out more than another number on a constant basis. Today your numbers could come up a lot but, tomorrow you may hardly ever see them. 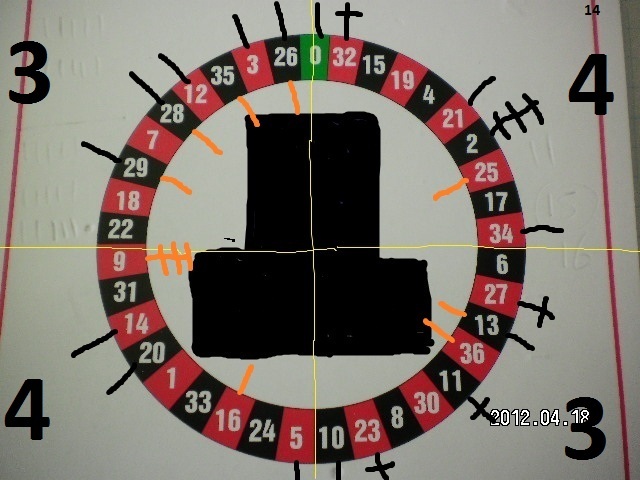 If you spin the wheel 37 times, this would give every number the same odds of coming out, but what you will find is that 1/3 of the numbers will not come out in 37 spins, this will not be the same numbers each time. 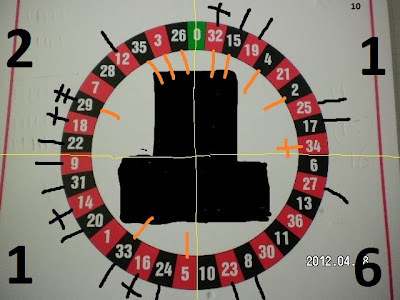 This means that around 12 numbers in every 37 spins will not come out. The same number can get caught in the 1/3 of numbers that don't come out, in the next 37 spins, and the next 37 spins, the number can get caught up to 7 times in a row, these numbers are called Cold numbers. "Stay away from them, they do not have to come out" resist what your mind tells you, but I know you will not listen to me, you will go for these numbers and at some point you will realize it's best to stay away. Because you have numbers that will not come out, then this means another number must come out in it's place. You will also get hot numbers, these are numbers that come out between 3 to 5 times in the 37 spins. 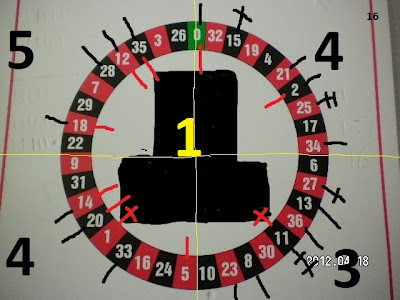 You will also get numbers that will come out only 1 time. 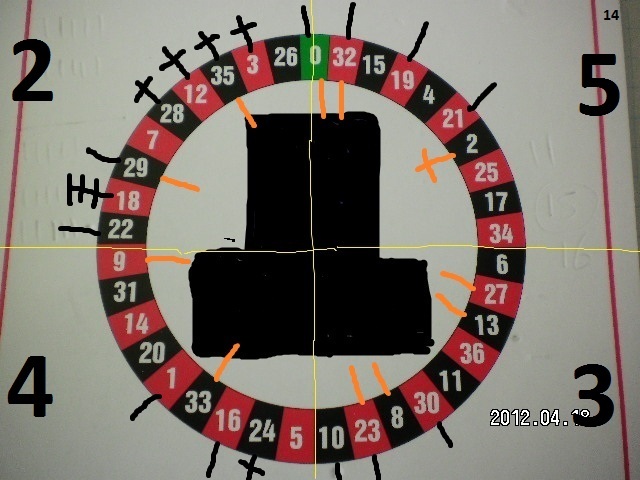 Here are 4 different real casino results of 37 spins. Each Black or Red pen mark on a number tells you how many times it came out. Do not worry about the colour in the picture that is explaining some thing else. Count every pen stroke (Red or Black) and it will add to 37 spins. Now count every number that there are no pen marks this will be close to 1/3 of 37 numbers. Count how many numbers come out 1 time. How many come out 2 times or 3 times. 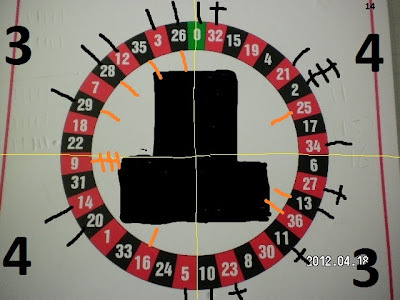 The large Black numbers "5,4,3,4" in the picture , means this is how many numbers did not come out in the last 37 spins, in that 9 numbers section or 1/4 of the wheel. You can do this with your own results, but remember these numbers are from a real casino. How can you find winning numbers ? 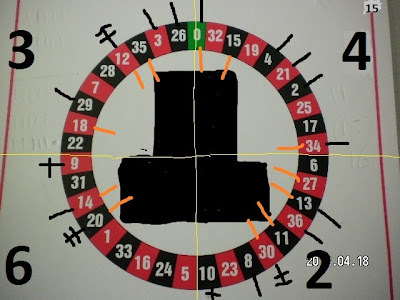 using luck, favorite numbers, setting traps. Every bet you make either costs you money every spin until you get a win. Wins or loses depending on which numbers come up and it's costs you nothing if other numbers come up. Will the way you play win in the long run. There are things to learn before you will know if your roulette numbers will come out, if you are serious about playing roulette then join my roulette newsletter and learn all the tips and real tricks to finding how to pick winning numbers to play.